On a few occasions the Lunar Reconnaissance Orbiter has been tilted to a steep angle, and used its Narrow Angle Cameras to gather oblique images like this one. 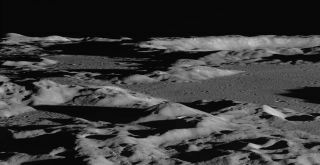 By looking across the landscape rather than straight down, topography and lighting angles are emphasized, giving a dramatic view of the lunar terrain. Sincethe surprise discovery last year of trace amounts of water on the moon,scientists have been redefining their concept of Earth?s rocky neighbor. Nowresearchers say the water on the moon comes in three different flavors. Untilrecently the moon was thought to be bone dry. But measurements in the last yearfrom the Mini-SAR and Moon Mineralogy Mapper (M3 or "M-cubed")instruments on India's Chandrayaan-1 moon probe and from NASA's recent LCROSSmission have proved that wrong. Mini-SARfound 40 craters, each containing frozen water at least 6.6 feet (2 meters)deep on the lunar surface ? which adds up to 600 million tonsof lunar ice stuff altogether. LCROSS slammed into the moon on Oct. 9, 2009and found evidence of water in another crater. "Sofar we've found three types of moon water," said Paul Spudis of the Lunarand Planetary Institute in Houston, Texas. "We have Mini-SAR's thicklenses of nearly pure crater ice, LCROSS's fluffy mix of ice crystals and dirt,and M-cube's thin layer that comes and goes all across the surface of themoon." LCROSSstruck moon water in a cold, permanently dark crater at the lunar south pole.Since then, the science team has been thoroughly mining the data collected fromthe intentional mooncrash. "Itlooks as though at least two different layers of our crater soil contain water,and they represent two different time epochs," said Anthony Colaprete,LCROSS principal investigator. "The first layer, ejected in the first 2seconds from the crater after impact, contains water and hydroxyl bound up inthe minerals, and even tiny pieces of pure ice mixed in. This layer is a thinfilm and may be relatively 'fresh,' perhaps recently replenished." Thisbrand of moon water resembles the water M3 discovered last year in scant butwidespread amounts, bound to the rocks and dust in the very top millimeters oflunar soil, scientists say. But the second layer is different. "Itcontains even more water ice plus a treasure chest of other compounds weweren't even looking for," he says. "So far the tally includes sulfurdioxide (SO2), methanol (CH3OH), and the curious organic molecule diacetylene(H2C4). This layer seems to extend below at least 0.5 meters and is probablyolder than the ice we?re finding on the surface.? Theresearchers don't yet know why some craters contain loads of pure ice whileothers are dominated by an ice-soil mixture. It's probably a sign that the moonwatercomes from more than one source. "Someof the water may be made right there on the moon," Spudis said. "Protons in the solar wind can make small amounts of water continuously onthe lunar surface by interacting with metal oxides in the rocks. But some ofthe water is probably deposited on the moon from other places in the solarsystem." "It'sa different world up there," says Spudis, "and we've barely scratchedthe surface. Who knows what discoveries lie ahead?"